Christmas is done and now we all look back on all those sugary treats and think… hmm maybe I shouldn’t have eaten all those cookies, brownies, pies, fudge and candies… what should I do now? Well if you are anything like me you will switch to some healthy alternatives to get your eating back on track and to help your body feel better! I came up with this recipe when I was looking for a way to disguise veggies in delicious foods because I knew I wasn’t eating enough of them. A friend of mine suggested putting spinach in a smoothie and once I tried it I’ve never looked back. You seriously can’t tell. I’ve even heard of people putting frozen okra in their smoothies and so I am going to try that next! Totally weird, but hey if it works, it works! 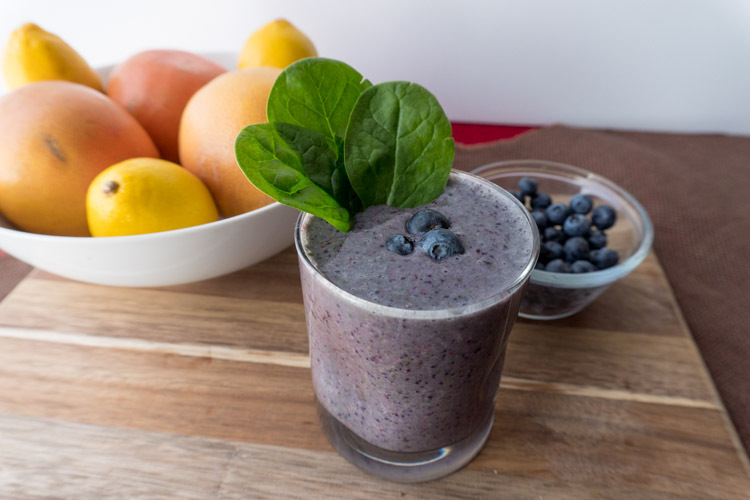 This spinach and fruit smoothie is also full of fiber. Did you know chia seeds have 5 grams of fiber per tablespoon! 5 grams! That is a ton! 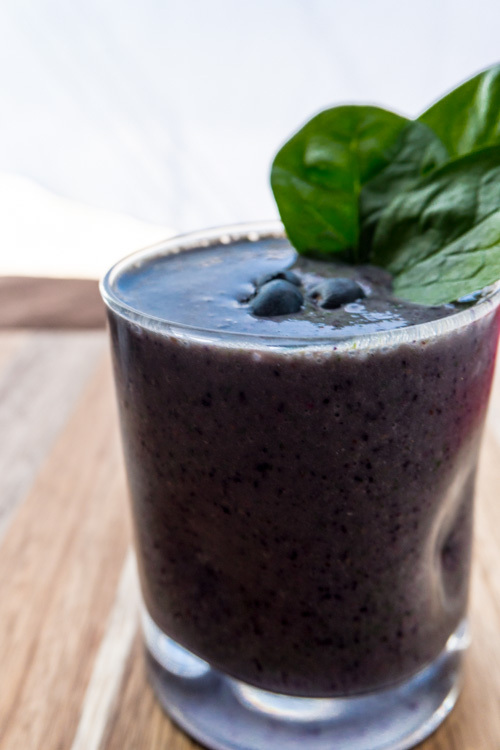 If you aren’t used to eating a lot a fiber I would recommend making this smoothie with 1 cup of spinach and 1 tbs of chia seeds and then add a little more each time you make it. Trust me, fiber is great, but if you aren’t used to consuming a bunch it will not make your stomach feel good. This recipe makes a lot. So split it into two large cups and share with your spouse, kid or neighbor! It’s so tasty, super filling and can we just appreciate how beautiful the color is! If you’re feeling adventurous you could even add some frozen raspberries in there and then call it a triple berry spinach smoothie! That would also taste delicious! 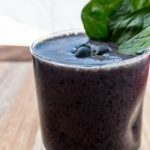 Well, if you are trying to reset you’re eating habits and get the New Year started off right give this healthy spinach and berry smoothie a try! It is sweet and filling and oh-so-delicious! 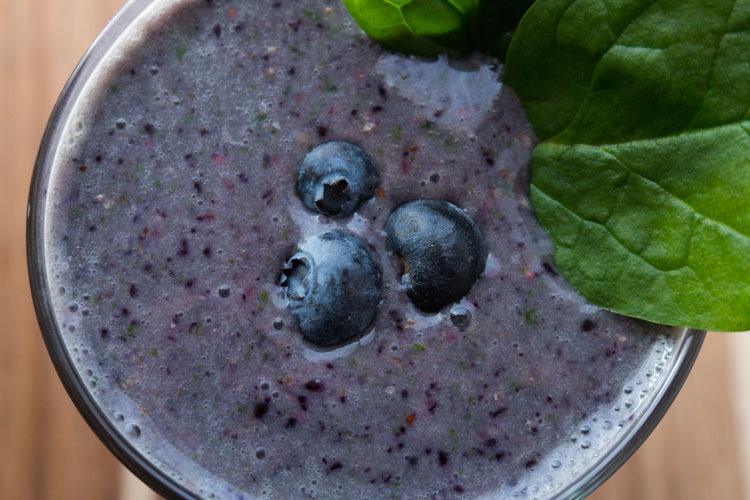 This spinach and berry smoothie is sooo good you won’t be able to get enough! It’s sweet , delicious and you can’t even tell there is spinach in it! This recipe makes enough for two!